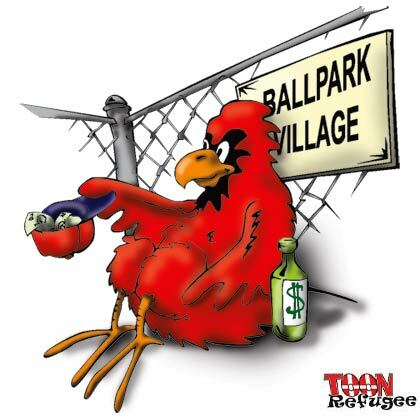 The St. Louis Post-Dispatch reported Sunday that the “Cards want public money for Ballpark Village.” This in spite of the fact that they haven’t begun to build the part of the village they promised in exchange for massive tax breaks when they built the new Busch Stadium. For the time being Ballpark Village remains a combination eyesore and parking lot. Thus the Cards joined the Kiel Partners who reneged on renovating the Kiel Opera in exchange for help building the Kiel/Savvis/Scottrade for the hockey Blues and the Rams who at least had the integrity not to promise anything in exchange for a sweetheart deal at the Dome at America’s Center/Transworld/Edward Jones Dome. Its tough not to see the Cards as greedy on this one. You won’t find a bigger fan and even I have started to question managements moves.